Tasso and Katina Kalliris moved to Kansas City from Greece in 1960 and started a family. With their growing family Tasso worked three jobs to provide but he had always dreamed of owning his own restaurant. In 1976, Tasso and Katina started selling Gyro sandwiches in a tiny bar in Brookside, Missouri. Little did they know they would have a line of people out the door waiting to get one of Tasso’s delicious Gyros. They worked hard and eventually saved enough to open their own restaurant on 75th Street. 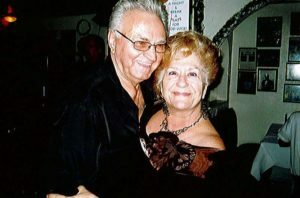 The popularity of Tasso’s Greek Restaurant continued to grow due to Tasso and Katina’s love of entertaining, celebrating life at the Greek table with delicious Greek food. As a result they expanded with dedicated chefs, catering services, and a welcoming staff was hired to meet the growing demands. Eventually the restaurant moved to its own free-standing building at 8411 Wornall where people can enjoy authentic Greek food, live music, belly dancing, breaking dishes, fun and hospitality with quality that is second to none. Today, son John is now managing the restaurant with his Father. We look forward to the wonderful opportunity when we can share our hospitality with you!